A field of up to 30 historic Formula 1 cars will line up on the grid for the Rolex Monterey Motorsports Reunion 2015, to be held August 13-16 at Mazda Raceway Laguna Seca during Monterey Classic Car Week. As featured in Ron Howard’s 2013 movie drama “Rush”, the same cars that were originally involved in the epic driving battle for the 1976 F1 World Championship between Ferrari’s Niki Lauda and McLaren’s James Hunt (who won by one point) will among the historically accurate and authentic cars competing at the Monterey Reunion 2015. The field is restricted to 3-liter Formula 1 cars that raced between 1967 and 1984 in the world’s premier racing series. Bearing driver names of Hunt, Lauda, Mario Andretti and Emerson Fittipaldi, the cars have been restored to their original specifications and livery. Only authentic cars that pass the scrutineering process are accepted to compete in the historic car race. 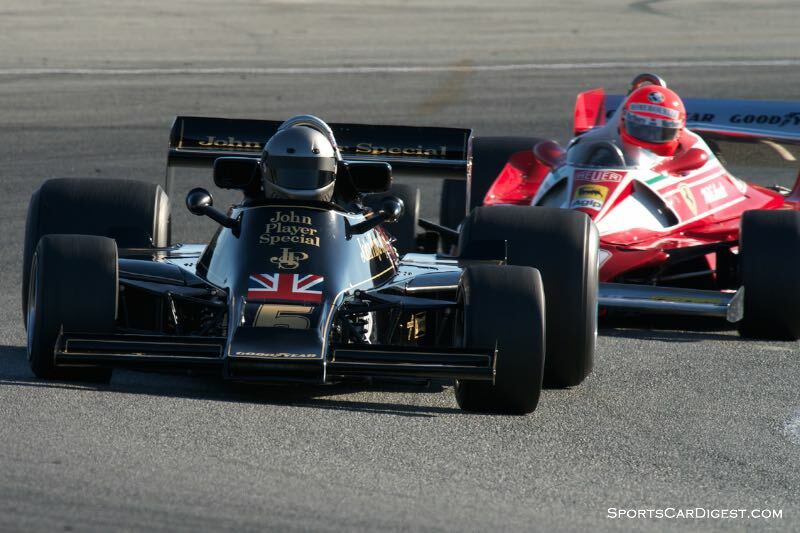 Formula 1 cars last raced at the Rolex Monterey Motorsports Reunion in 2013, and typically alternate years with the thunderous Can-Am cars of the ’60 and early ‘70s. The tradition that began in 1974 that features a marque to honor continues with the commemoration of the 50th anniversary of the Shelby GT350. While Carroll Shelby and the Shelby Cobra have been honored in the past, this is the first time the GT350 is the special marque. Ford Motor Company is supporting the achievement with what will be a memorable paddock heritage display. For full ticket information and event schedule, visit MazdaRaceway.com or call the ticket office at 831-242-8200. Tickets begin at $50 for a Friday general admission and range up to $510 for a three-day ticket inside the Premier Pit Row Suite. It’s too bad Historic F1 Racing thinks that F1 ended in 1984. I can assure you that none of the participants think that that F1 ended in 1984. The cut off date is determined more by cost and ability to maintain the cars. These cars are centered on the Cosworth era which represent the last of the engines, transmissions that can be maintained without spending a vast fortune….a fortune is spent on these cars as it is. There have been demonstration laps of recent F1 cars. When Ferrari was the mark the factory brought out a handful of current F1 cars and the staff to run them for demonstration.